Where to buy pellets? - The BBQ BRETHREN FORUMS. Just wondering if anyone has found a good online source to purchase wood pellets from. I have a Country Smoker and absolutely love it (as do all of my neighbors). 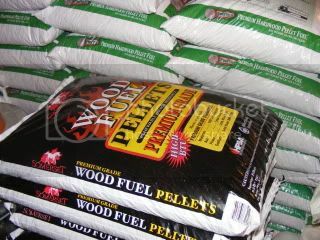 The only local supplier of pellets is a higher end fireplace dealer that charges full price for traeger pellets. I've ordered from cookinpellets and like the pellets, it's just the dang shipping is so high. Any recommendations? Also, anyone found heating pellets with food grade binders/lube? Have you googled: Treager, FEC or Louisiana Dealers? Order 400 or more pounds for freight rate. Talk to Candy about local dealers to you. Great pellets! Also talk to Stuart at Cookshack about the new pellets that he's coming out with. They're available, but I don't think he's done a big marketing push on them yet. Probably only get them from Cookshack. Best bet is to find local dealers. Shipping can get expensive, but a good price may offset the freight. Also, call Bobby at www.kck.com. Tell him Plowboy sent you and see if he can work you a deal. He carries a couple of different brands. Save a hog, ride a plowboy! Also talk to Stuart at Cookshack about the new pellets that he's coming out with. Yes, CS will no longer be vending those @#$%@#$ Traeger Pellets. The new pellets will be the blended/hardwood variety. I believe they'll be out for sale by Dec if not sooner. One thing to do is look on this forum and tell people that you're making a bulk buy of pellets. I know groups of guys that do this and split the shipping. And you'll find out who pellet guys are. You may also want to check out if there is a Do It Best Hardware store or a Tractor Supply store in your area. They sell Somerset Oak pellets for heating, but Somerset uses all food grade lubricants in their processing. They don't openly advertise them for cooking, but......they are $5-$6 for a 40 pound bag!!!!!! Both of these retail chains often substitute brands, so be sure to ask which brand they carry in the store. The website will say Somerset, but don't rely on it!!! I buy from cookinpellets and usually start out with them for the first couple of hours for the flavor on a low and slow cook and then use the oak pellets for the remainder of the cook. All of that being said, I'm now going to slightly hijack your thread and ask about your country smoker! I have a CS-680, and am still having issues with wide temp ranges from end to end. The temps can vary by 40 degress from left to right, with the right side being the high end. I am also getting pretty hot temps in the extreme front and back from where the heat comes around the heat shield. Have you done any mods to improve your temperature consistency??? Anyone else use Summerset Pellets. I see that Lowes carries them and was thinking of trying them. I have bought pellets from almost every source out there. For me, the most consistant supplier is Candy Sue at BBQ'r Delight. but Chris's supply is too "iffy" to count on. I bought several orders from Candy Sue to test them. Cost about $1.25 plus per pound. Yesterday, I ordered 400 # and paid less than 65 cents per pound with shipping!!!! 80# Mesquite, 120# Hickory, and 200# Cherry. That will get me through 2010 about right. It is amazing how many pounds you use with comps, recreational, and other cooking. Don't even mess with it. Contact Candy and order her BBQr's Delight. Best pellets going out there!!! I have been using Somerset pellets for the last few months. They are mostly oak and they use veggie oil for lube in equipment. GREAT pellets. I bought 10 bags and should have bought a ton. I have smoked some with Pro Pellets too. They work well but I prefer the Somersets. Are those food safe? From the little I've read about Summerset, they seem to be produces for heating.